Buy this item and earn 2,925 ClubPoints. 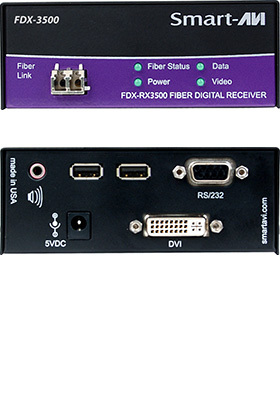 FDX-3500 consists of a transmitter and receiver that extend USB keyboard/mouse, DVI-D video, audio and RS-232 signals. 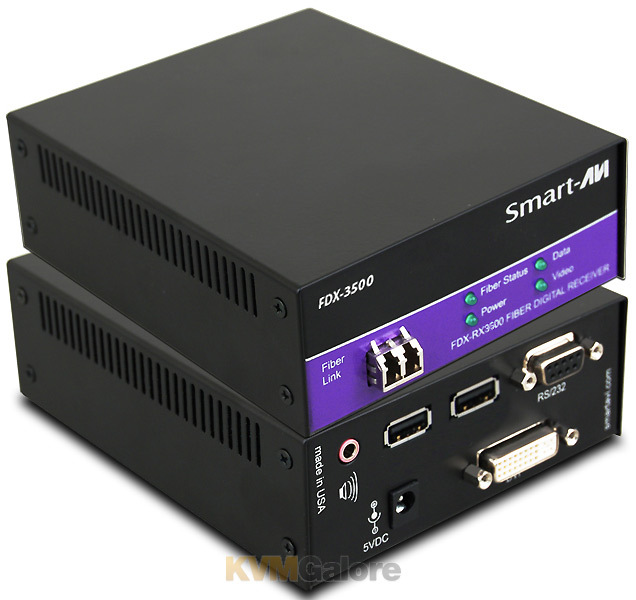 FDX-3500 is a professional quality KVM extender capable of extending signals up to 15 kilometers over a single singlemode fiber optic cable. Smart-AVI has created a full line of fiber optic extender products, understanding that this technology is superior to traditional cabling. • Capable of transmitting over very long distances with no signal loss. • Immune to electromagnetic interference. In situations where there is considerable interference, fiber optic cabling is the only solution. • Much more secure because they cannot be easily tapped. For this reason, military and law enforcement agencies use fiber optic cables for the transmission of sensitive data. • Relatively inexpensive and small enough to be routed through small spaces.